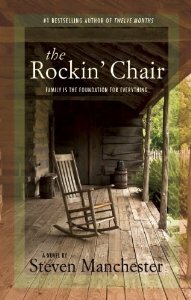 Today I welcome Steven Manchester, author of The Rockin' Chair, to the blog. Read on for more information on this new release, including an excerpt from the book. It was a bitterly cold Saturday morning when friends from far and wide came to pay their respects. Everyone who knew Alice adored her and equally loved her grieving husband. The McCarthy’s tiny field of granite was filled with mourners. As the preacher spoke, an eerie silence filled the frozen air. The preacher had just finished his sermon when John dropped to both knees and spoke to his wife. “I see now, squaw. Seems I still got some chores that need tendin’ to.” He placed his lips to the frozen casket and kissed her. “You’re right, as usual. There’s some mendin’ to be done. So leave the porch light on for me and I’ll be along when I’m through.” Standing slowly, he straightened out his back and steeled himself for the chores ahead of him. I still got a few more miles to go, he decided. And it looks like I’ll be travelin’ all the way to hell to reclaim these kids. It was time to take them back from the evils of society. Steven Manchester is the published author of the #1 best seller, Twelve Months, as well as A Christmas Wish (the holiday prequel to Goodnight, Brian) and Goodnight, Brian. He is also the Pressed Pennies, The Unexpected Storm: The Gulf War Legacy and Jacob Evans, as well as several books under the pseudonym, Steven Herberts. His work has appeared on NBC's Today Show, CBS's The Early Show, CNN’s American Morning and BET’s Nightly News. Recently, three of his short stories were selected "101 Best" for Chicken Soup for the Soul series. Buy from Amazon or Barnes and Noble.